Face powder is hardly exciting, but it can play a big role in adding polish to your finished look, not to mention helping your makeup last longer. 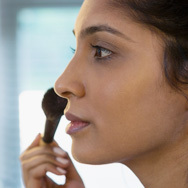 If you think face powder isn’t for you, it’s likely you haven’t found the right one yet. Here are some tips to help you find a powder that works best for your skin type and needs. What is the Best Face Powder for Me? The first step in choosing a powder is to determine how you want it to work for you. Are you looking for something to set your foundation and make it last longer? Is shine control your main concern? Or do you want a fresh, glowing look that keeps your makeup from creasing? If you want a powder that improves the staying power of your makeup, look for products labeled as “setting” or “finishing” powders. These all-purpose powders can keep foundation from separating and, to some degree, protect it from the effects of heat and humidity. If you have oily or combination skin, consider a powder that’s described as “mattifying,” “oil control,” “shine control,” or “blotting.” A powder with these qualities generally has additional absorbent ingredients to help with oily skin concerns. However, this is not the powder for those with dry to very dry skin because the extra absorbency will likely make dry skin feel tighter and uncomfortable. What if you do have dry skin? Using powder is still a good idea because it can keep your makeup from creasing. Just seek out formulas that go a bit lighter on the absorbent ingredients, like starches and clays. If you want to enliven dull, dry skin, choose products that have words like “glow,” “luminous,” or “brightening” in their descriptions. These types generally include mineral pigments that reflect light off the face, and have a softer texture. Once you’ve selected the role you want your powder to play, there are a couple of other factors to consider, which are mainly a matter of personal preference. Do you want a tinted powder, or a translucent face powder? Tinted powders can enhance the color of your foundation, but if you’re happy with the color of your base makeup and want no changes, translucent is the way to go. There’s also the consideration of pressed or loose powder. Loose powder is easier to pick up on a brush and it’s easier to tell how much you’re using, but for touching up on the go, pressed powder is a much less messy option! Once you’ve picked your powder, it’s time to put it to work. Applying all over the face seems like the simplest solution, but most people don’t need a full face of powder. Too much powder all over the face—even if it’s the most finely milled, silkiest powder—can wind up looking chalky and emphasizing skin irregularities, like bumps and dry patches. If you’re looking to set foundation, a fine dusting is all you really need. To combat shine, buff a bit of powder just in the areas where shine is your biggest concern. For setting concealer, apply it only to those areas where you wear concealer. If you want to add luminosity to skin, put the powder on areas where light naturally hits the face (like the cheeks, nose, and forehead). Follow these tips, and this unsung hero of the makeup world might become your new favorite product!